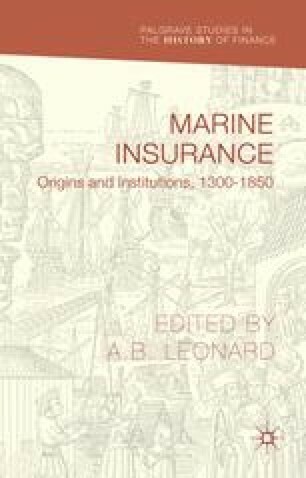 Extant information about early English marine insurance follows a discontinuous trend. It is remarkably scarce until the mid-sixteenth century, when it increases substantially in the space of a few years, only to fade again after a few decades, and return to growth towards the end of the seventeenth century. After that, plenty of records remain. However, this misbehaving trend does not affect our knowledge as much as would appear to be the case at first sight. The reason lies in the unparalleled continuity in English insurance policies, which remained nearly identical from the 1570s to the policy model prescribed in the Marine Insurance Act of 1906 (First Schedule). This makes up, at least in part, for the gaps in the available evidence during the seventeenth century.